FloorGuard collects basement water entering and leaking through the floor to wall crack called a cove joint, through concrete block cracks, concrete cracks, leaking tie holes and other defects. The strong High Density Polyethylene dimples diverts the water to the interior underslab drain tile system. FloorGuard can be used to stop leaks through basement floors or can be used to prevent leaks during new construction. FloorGuard creates a space for water to flow under the slab. This gives a high rate of flow, up to 30 gallons/min/sq. ft. The water flows across the footing and into the gravel aggregate under the basement slab. From there the water flow to a sump pump or to a gravity drain to the exterior. This prevents water from getting onto the basement floor. The homeowners possessions are safe from water damage. Also, the air quality of the basement is increased. A lack of moisture prevents mold and mildew from growing. When a contractor adds FloorGuard to the perimeter of your basement, they are ensuring that inadvertent leaks will not occur. Whether the water comes from the floor and wall seam, a leaking tie, a crack or a window, the water will flow down and under the basement floor. A simple and low cost preventive measure keeps your possessions and home safe. FloorGuard channels water that flows down a basement wall to the under slab drainage system, no matter the source. It could be a leaky window, wall crack, concrete block wall crack, basement floor cracks, foundation tie hole or pipe penetration. FloorGuard also channels water that flows through the basement wall and footing joint. This is often times seen as water flowing up through the crack between the wall and floor. After being diverted to the interior drainage system, a sump pump will remove the collected water. Or the interior drainage system may drain water by gravity to a point outside the home. FloorGuard is a vital element for a properly functioning basement interior drainage system. Basements with inadequate water drainage can have water coming up through the cracks in a floor and at the joint between the floor and wall. Installation of a 4″ corrogated drain tile, surrounded by washed stone and emptying into a sump pump will keep your home’s basement dry. FloorGuard’s role is to collect any water that leaks through a basemant wall, crack or up through the joint between the floor and wall. Removal of 18″ of the concrete floor slab is needed to allow placement of the drain tile. Add washed stone to protect the drain tile. The drain tile flows to a sump pit which holds the sump pump. Finally, the sump pump removes the water from the home. FloorGuard is placed on top of the foundation footing. Fold FloorGuard so that an amount goes up the wall that is level with the basement floor. Attach to the wall with screws or nails. Attach the FloorGuard Profile Strip and seal with ATC 100 Sealant and Adhesive. Next, reinstall the concrete slab. Concrete block basement walls are particularly prone to water leaking into the basement. That is becasue the concrete block is porous and hollow. Water vapor and liquid water enter the block and fill the void inside. Eventually, after many years and rains, it is possible for water to be several feet high inside the wall. 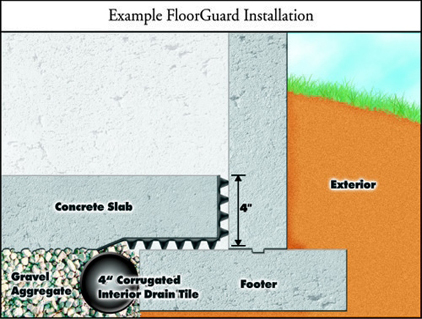 Installation of FloorGuard will collect that water and divert it under the slab to the 4″ corrogated drain tile. Drilling holes into the bottom course of block will allow water that enters the wall and collects inside the concrete block to drain to FloorGuard and under the slab. *NOTE* For safety, it is recommended that all electrical tools be connected to a GFCI outlet during repair.